History of Labor Turnover in the U.S.
Labor turnover measures the movement of workers in and out of employment with a particular firm. Consequently, concern with the issue and interest in measuring such movement only arose when working for an employer (rather than self-employment in craft or agricultural production) became the norm. The rise of large scale firms in the late nineteenth century and the decreasing importance (in percentage terms) of agricultural employment meant that a growing number of workers were employed by firms. It was only in this context that interest in measuring labor turnover and understanding its causes began. Labor turnover is typically measured in terms of the separation rate (quits, layoffs, and discharges per 100 employees on the payroll). The aggregate data on turnover among U.S. workers is available from a series of studies focusing almost entirely on the manufacturing sector. These data show high rates of labor turnover (annual rates exceeding 100%) in the early decades of the twentieth century, substantial declines in the 1920s, significant fluctuations during the economic crisis of the 1930s and the boom of the World War II years, and a return to the low rates of the 1920s in the post-war era. (See Figure 1 and its notes.) Firm and state level data (from the late nineteenth and early twentieth centuries) also indicate that labor turnover rates exceeding 100 were common to many industries. Contemporaries expressed concern over the high rates of labor turnover in the early part of the century and conducted numerous studies to understand its causes and consequences. (See for example, Douglas 1918, Lescohier 1923, and Slichter 1921.) Some of these studies focused on the irregularity in labor demand which resulted in seasonal and cyclical layoffs. Others interpreted the high rates of labor turnover as an indication of worker dissatisfaction and labor relations problems. Many observers began to recognize that labor turnover was costly for the firm (in terms of increased hiring and training expenditures) and for the worker (in terms of irregularity of income flows). Both the high rates of labor turnover in the early years of the twentieth century and the dramatic declines in the 1920s are closely linked with changes in the worker-initiated component of turnover rates. During the 1910s and 1920s, quits accounted (on average) for over seventy percent of all separations and the decline in annual separation rates from 123.4 in 1920 to 37.1 in 1928 was primarily driven be a decline in quit rates, from 100.9 to 25.8 per 100 employees. The aggregate decline in labor turnover in the 1920s appears to be the beginning of a long run trend. Numerous studies, seeking to identify why workers began quitting their jobs less frequently, have pointed to the role of altered employment relationships. (See, for example, Owen 1995b, Ozanne 1967, and Ross 1958.) The new practices of employers, categorized initially as welfare work and later as the development of internal labor markets, included a variety of policies aimed at strengthening the attachment between workers and firms. The most important of these policies were the establishment of personnel or employment departments, the offering of seniority-based compensation, and the provision of on-the-job training and internal promotion ladders. In the U.S., these changes in employment practices began at a few firms around the turn of the twentieth century, intensified during WWI and became more widespread in the 1920s. However, others have suggested that the changes in quit behavior in the 1920s were the result of immigration declines (due to newly implemented quotas) and slack labor markets (Goldin 2000, Jacoby 1985). Even the motivation of firms’ implementation of the new practices is subject to debate. One argument focuses on how the shift from craft to mass production increased the importance of firm-specific skills and on-the-job training. Firms’ greater investment in training meant that it was more costly to have workers leave and provided the incentive for firms to lower turnover. However, others have provided evidence that job ladders and internal promotion were not always implemented to reward the increased worker productivity resulting from on-the-job training. Rather, these employment practices were sometimes attempts to appease workers and to prevent unionization. Labor economists have also noted that providing various forms of deferred compensation (pensions, wages which increase with seniority, etc.) can increase worker effort and reduce the costs of monitoring workers. Whether promotion ladders established within firms reflect an attempt to forestall unionization, a means of protecting firm investments in training by lowering turnover, or a method of ensuring worker effort is still open to debate, though the explanations are not necessarily mutually exclusive (Jacoby 1983, Lazear 1981, Owen 1995b, Sundstrum 1988, Stone 1974). In the 1930s and 1940s the volatility in labor turnover increased and the relationships between the components of total separations shifted (Figure 1). The depressed labor markets of the 1930s meant that procyclical quit rates declined, but increased layoffs kept total separation rates relatively high, (on average 57 per 100 employees between 1930 and 1939). During the tight labor markets of the World War II years, turnover again reached rates exceeding 100%, with increases in quits acting as the primary determinant. Quits and total separations declined after the war, producing much lower and less volatile turnover rates between 1950 and 1970 (Figure 1). Though the decline in labor turnover in the early part of the twentieth century was seen by many as a sign of improved labor-management relations, the low turnover rates of the post-WWII era led macroeconomists to begin to question the benefits of strong attachments between workers and firms. Specifically, there was concern that long-term employment contracts (either implicit or explicit) might generate wage rigidities which could result in increased unemployment and other labor market adjustment problems (Ross 1958). More recently, labor economists have wondered whether the movement toward long-term attachments between workers and firms is reversing itself. “Changes in Job Stability and Job Security” a special issue of the Journal of Labor Economics (October 1999) includes numerous analyses suggesting that job instability increased among some groups of workers (particularly those with longer tenure) amidst the restructuring activities of the 1990s. The historical analyses of labor turnover have relied upon two types of data. The first type consists of firm-level data on turnover within a particular workplace or governmental collections (through firms) of data on the level of turnover within particular industries or geographic locales. If these turnover data are broken down into their components – quits, layoffs, and discharges – a quit rate model (such as the one developed by Parsons 1973) can be employed to analyze the worker-initiated component of turnover as it relates to job search behavior. These analyses (see for example, Owen 1995a) estimate quit rates as a function of variables reflecting labor demand conditions (e.g., unemployment and relative wages) and of labor supply variables reflecting the composition of the labor force (e.g., age/gender distributions and immigrant flows). Another measure of worker/firm attachment is tenure – the number of years a worker stays with a particular job or firm. While significant declines in labor turnover (such as those observed in the 1920s) will likely be reflected in rising average tenure with the firm, high rates of labor turnover do not imply that long tenure is not present among the workforce. If high turnover is concentrated among a subset of workers (the young or the unskilled), then high turnover can co-exist with the existence of life-time jobs for another subset (the skilled). For example, the high rates of labor turnover that were common until the mid-1920s co-existed with long term jobs for some workers. The evidence indicates that while long-term employment became more common in the twentieth century, it was not completely absent from nineteenth-century labor markets (Carter 1988, Carter and Savoca 1990, Hall 1982). The turnover data used to generate Figure 1 come from three separate sources: Brissenden and Frankel (1920) for the 1910-1918 data; Berridge (1929) for the 1919-1929 data; and U.S. Bureau of the Census (1972) for the 1930-1970 data. Several adjustments were necessary to present them in a single format. The Brissenden and Frankel study calculated the separate components of turnover (quits and layoffs) from only a subsample of their data. The subsample data were used to calculate the percentage of total separations accounted for by quits and layoffs and these percentages were applied to the total separations data from the full sample to estimate the quit and layoff components. The 1930-1970 data reported in Historical Statistics of the United States were collected by the U.S. Bureau of Labor Statistics and originally reported in Employment and Earning, U.S., 1909-1971. Unlike the earlier series, these data were originally reported as average monthly rates and have been converted into annualized figures by multiplying times 12. The establishments from which the Bureau of Labor Statistics has secured labor mobility figures have necessarily been the concerns which had the figures to give, that is to say, concerns which had given rather more attention than most firms to their force-maintenance problems. These firms reporting are chiefly concerns which had more or less centralized employment systems and were relatively more successful in the maintenance of a stable work force (1920, p. 40). A similar underestimation bias continued with the BLS collection of data because the average firm size in the sample was larger than the average firm size in the whole population of manufacturing firms (U.S. Bureau of the Census, p.160), and larger firms tend to have lower turnover rates. Second, the data for 1910-1918 (Brissenden and Frankel) includes workers in public utilities and mercantile establishments in addition to workers in manufacturing industries and is therefore not directly comparable to the later series on the turnover of manufacturing workers. However, these non-manufacturing workers had lower turnover rates than the manufacturing workers in both 1913/14 and 1917/18 (the two years for which Brissenden and Frankel present industry-level data). 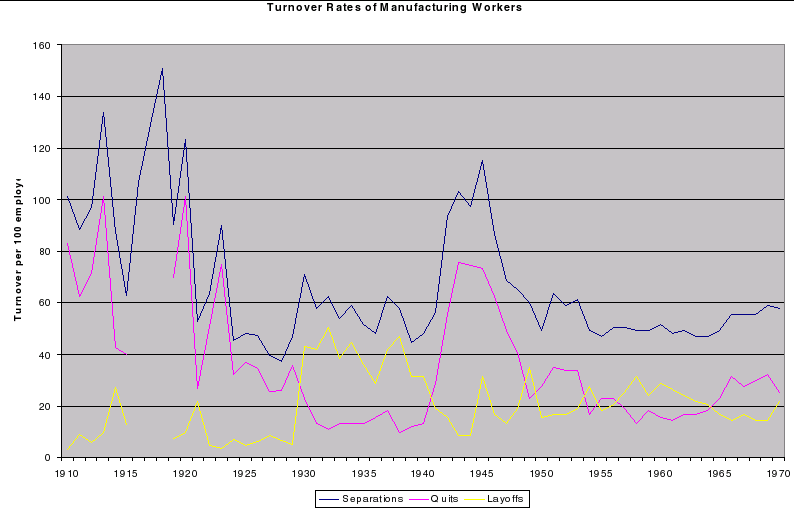 Thus, the decline in turnover of manufacturing workers from the 1910s to the 1920s may actually be underestimated. Third, the turnover rates for 1910 to 1918 (Brissenden and Frankel) were originally calculated per labor hour. The number of employees was estimated at one worker per 3,000 labor hours – the number of hours in a typical work year. This conversion generates the number of full-year workers, not allowing for any procyclicality of labor hours. If labor hours are procyclical, this calculation overstates (understates) the number of workers during an upswing (downswing), thus dampening the response of turnover rates to economic cycles. Fourth, total separations are broken down into quits, layoffs, discharges and other (including military enlistment, death and retirement). Prior to 1940, the “other” separations were included in quits. Berridge, William A. “Labor Turnover in American Factories.” Monthly Labor Review 29 (July 1929): 62-65. Brissenden, Paul F. and Emil Frankel. “Mobility of Labor in American Industry.” Monthly Labor Review 10 (June 1920): 1342-62. Carter, Susan B. “The Changing Importance of Lifetime Jobs, 1892-1978.”Industrial Relations 27, no. 3 (1988): 287-300. Carter, Susan B. and Elizabeth Savoca. “The ‘Teaching Procession’? Another Look at Teacher Tenure, 1845-1925.” Explorations in Economic History 29, no. 4 (1992): 401-16. Carter, Susan B. and Elizabeth Savoca. “Labor Mobility and Lengthy Jobs in Nineteenth-Century America.” Journal of Economic History 50, no. 1 (1990): 1-16. Douglas, Paul H. “The Problem of Labor Turnover.” American Economic Review 8, no. 2 (1918): 306-16. Goldin, Claudia. “Labor Markets in the Twentieth Century.” In The Cambridge Economic History of the United States, III, edited by Stanley L. Engerman and Robert E. Gallman, 549-623. Cambridge: Cambridge University Press, 2000. Hall, Robert E. “The Importance of Lifetime Jobs in the U.S. Economy.” American Economic Review 72, no. 4 (1982): 716-24. Jacoby, Sanford M. “Industrial Labor Mobility in Historical Perspective.” Industrial Relations 22, no. 2 (1983): 261-82. Jacoby, Sanford M. Employing Bureaucracy: Managers, Unions, and the Transformation of Work in American Industry, 1900-1945. New York: Columbia University Press, 1985. Lazear, Edward. P. “Agency, Earnings Profiles, Productivity, and Hours Reduction.” American Economic Review 71, no. 4 (1981): 606-19. Lescohier, Don D. The Labor Market. New York: Macmillan, 1923. Maloney, Thomas N. “Racial Segregation, Working Conditions and Workers’ Health: Evidence from the A.M. Byers Company, 1916-1930.” Explorations in Economic History 35, no. 3 (1998): 272-95. Owen, Laura .J. “Worker Turnover in the 1920s: What Labor Supply Arguments Don’t Tell Us.” Journal of Economic History 55, no.4 (1995a): 822-41. Owen, Laura J. “Worker Turnover in the 1920s: The Role of Changing Employment Policies.” Industrial and Corporate Change 4 (1995b): 499-530. Ozanne, Robert. A Century of Labor-Management Relations at McCormick and International Harvester. Madison: University of Wisconsin Press, 1967. Parsons, Donald O. “Quit Rates Over Time: A Search and Information Approach.” American Economic Review 63, no.3 (1973): 390-401. Ross, Arthur M. “Do We Have a New Industrial Feudalism?” American Economic Review 48 (1958): 903-20. Slichter, Sumner. The Turnover of Factory Labor. New York: Appleton, 1921. Stone, Katherine. “The Origins of Job Structures in the Steel Industry.” Review of Radical Political Economy 6, no.2 (1974): 113-73. Sundstrom, William A. “Internal Labor Markets before World War I: On-the-Job Training and Employee Promotion.” Explorations in Economic History 25 (October 1988): 424-45. U.S. Bureau of the Census. Historical Statistics of the United States, Colonial Times to 1970. Washington, D.C., 1975. Whatley, Warren C. and Stan Sedo. “Quit Behavior as a Measure of Worker Opportunity: Black Workers in the Interwar Industrial North.” American Economic Revie w 88, no. 2 (1998): 363-67.